Arcane Enchanted is one of the Boss Modifiers in Diablo III; a property that Bosses and Champions spawn with that grants them special abilities. 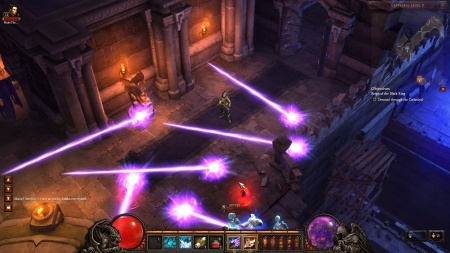 This modifier "enchants" the monster with "arcane" energy; Arcane is one of the main damage types in Diablo III, distinguished by a purple coloration. Numerous "second hands" create a hazardous field. Arcane does not add a purple glow + Arcane damage to the monster's regular attacks. There are no visual cues at all, until the monsters cast one of their "Arcane turret" attack modules. These rotate slowly and deal heavy damage to any player they strike. Available to: Bosses and Champions. Arcane Enchanted is considered one of the most dangerous and deadly of Elite Affixes, especially when combined with a CC property such as Waller or Jailer or Vortex. Arcane Enchanted bosses and champions have extra resistance to Arcane attacks, but more noticeable and dangerous is their ability to create Arcane needles. These appear with a small dot of purple light that grows larger until after about a second the Arcane needle appears. Each needle rotates slowly, dealing huge damage to any player or pet it impacts. The purple blade functions like the second hand of a clock, slowly turning in a circle and dealing substantial Arcane damage to any character who comes into contact with them. The hands each make about 1.25 revolutions before dispelling, and the speed and dimension of the hand is always the same on all difficulty levels. They are cast more frequently on higher difficulty levels, and of course they do far more damage as well. The hands can not be stopped or blocked by anything, including character equipment, and the beam will turn freely, passing right through walls, over ledges, through Waller obstacles, etc. Monsters are unaffected by the beam. Each enemy (Boss, minion, or Champion) "casts" an Arcane needle at random intervals. The monster "casting" the Arcane needle must remain alive until the purple orb coallesces into the fully-formed needle. Killing a monster before the needle it just cast has formed will cause the needle to dispel harmlessly. Once a needle is functional though, it will persist for its full time whether or not the Elite that cast it remains alive. A given enemy monster will very seldom cast two needles at the same time. Only bosses occasionally cast two in a row, and there are very seldom more needles than monsters alive at a given time. Demon Hunter and Templar take hits. Many needles are very dangerous. Numerous Hydra heads force a speedy Demon Hunter retreat. Arcane Enchanted bosses had a very different attack during development, and when the beta test began this effect was still in the game. At that point instead of the slowly spinning turret, a purple Hydra was summoned, just like the one seen in the Wizard spell. Instead of three heads there was just one, but the dragon fired Arcane bolts very quickly, and at the time it was easily the most dangerous boss effect in the entire game. The Hydras were cast at various points during the fight, and always when the boss or Champion died, and the hydra heads generally appeared directly beneath the feet of the player, forcing a quick move to get out of range. Despite the danger, the Arcane Hydra form was very popular with fans and there was general player discontent when the danger was much nerfed in this change of form. For inexperienced players this was a terrible surprise and many players died before they even knew they were in danger. Looking back after Diablo III's release, the property seems a lot less dangerous. Players have to be aware of Desecrator and Plagued modifiers appearing right under the feet, and that early form of Arcane wasn't much different; it just had a bit more range to it. 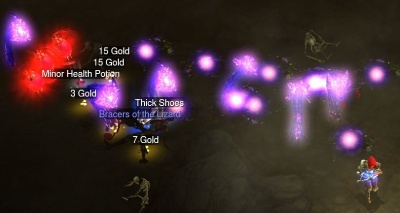 Lots of Hydras from puking zombies. The Arcane type of damage is new in Diablo III, and was not present in Diablo 1 or Diablo 2. Arcane is most commonly found on a number of Wizard spells, and is easily-spotted by the bright purple coloration of such attacks. There are boss modifiers for all of the damage types, but Arcane clearly presented a naming challenge for the developers. The other elemental damage type boss modifiers all got a one-word name: Poison = Plagued, Lightning = Electrified, Fire = Molten, and Cold = Frozen. But Arcane doesn't translate so easily. You can envision the developers trying out terms like "Arcane-ified" or "Arcaned," and finding them wanting. Hence the two word solution, "Arcane Enchanted." It's odd that the developers didn't go with that format for all of the boss modifiers, just for the sake of consistency. Cold Enchanted, Fire Enchanted, Lighting Enchanted, and Poison Enchanted along with Arcane Enchanted. After all, that's how the boss modifier naming system worked in Diablo II. This page was last edited on 14 October 2013, at 11:14.